This one’s not about NaNoWriMo. Well, I guess we won’t be seeing a return of the app that gave us “Christmas magic” from our fun red Starbucks cups. While I appreciate that Starbucks enjoys changing with the times, my children will be heartbroken once again. Last year I could not adequately explain to the munchkins why Starbucks decided not to do the Christmas app with the cool, fun animation using the characters on their red holiday cups. And they even took off the cute Christmas characters! I don’t know about all of you but that made trips to Starbucks exciting for us. I just don’t know if I’ll be up to braving the crowds quite as often this year. It’s not just Starbucks either. It’s everywhere you go. Christmas just isn’t what it used to be. Toys are inappropriate and cheaply made. I miss the Christmas spirit! I miss hearing Christmas carols(real ones) on street corners. I miss seeing dreamy smiles on people’s faces as they go by laden down with packages and bags. Happy holidays just doesn’t quite do it for me. If today’s post is a little ranty for you, blame Starbucks. I was so excited when I got the e-mail that the red cups were back, I got up this morning and decided to blog about the red cups being back. 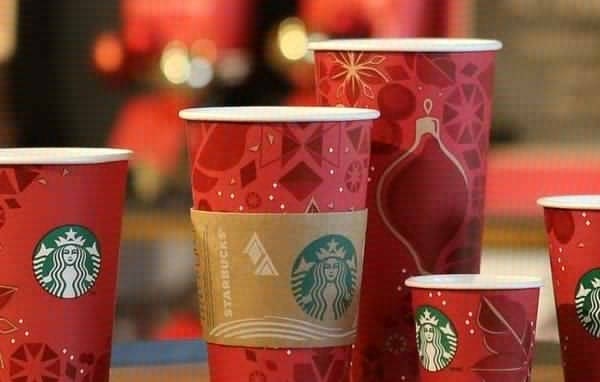 Then I went looking for a picture and discovered that this years cups barely even look like Christmas cups.